Our wooldancer.com web-store has now hit the scene! Your newest Aussie-based online store for creative contemporary handspun yarn, fiber supplies & wearable art. Please join us to Celebrate our Grand Opening Sale! Many items are marked at least 15% off until midnight tonight! Announcing fellow Indie Yarn artists.. 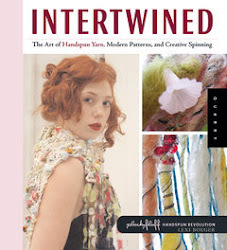 I wish to warmly welcome one of my favorite spinsis*stars, Shannon Herrick, corespun goddess herself from The Spun Monkey.. Her handspuns are immaculate & we also carry her Monkey Wrap pattern..
be sure to check out all the spinny goodness..
International and local Indie yarn & fiber artists are arriving each month to our online store.. Now fellow Aussie fiberistas will be able to buy some fav Art Yarns & pay only local postage - woohoo! Also, now you can find Indie-spins from around the world on Aussie soil at Wooldancer Events.. Very exciting for Aussie knitters who like to fondle fibers before purchasing.. well who can't resist! Workshops & Events Breaking news.. I am trading at the NSW Weavers & Spinners Guild Open Day in Sydney..
9.30am - 3pm, St Paul's Church, Burwood Rd. Burwood. Lorien Novalis Steiner School market in Glenhaven, with Wooldancer & Timor Tais.. See website for details. A new fundraising initiative to donate spinning & weaving equipment and supplies to women artists from East Timor. Purchase handmade items & help village fiber arts to survive.. updating regularly. let's see what else you can squizz at, there is so much to mention! 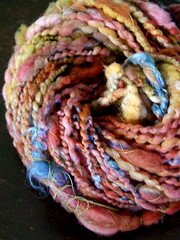 There is an awsome selection of Art Yarn growing.. including my latest megaspun, Archaelological (above). And some fab spinners kits too.. Copper Patina Bliss Batt set pictured here.. we are having a right fuzz-fest here! Please browse around our store & take advantage of the Opening Sale.. discounts can only offered every blue moon at wooldancer.com.. be sure to make the moment last! hope you can join me in the fuzz-fest! Your blog always amazes me....you're so good at this blogging thing! you've been tagged...it's a bit of fun....see my blog.